UNITED NATIONS, August 15 -- With even the UN's watered-down Southern Kordofan report alleging war crimes there, Inner City Press on Monday asked UN Security Council president Hardeep Singh Puri about the Press Statement on the topic which "died an untimely death on Friday." "I am reluctant to use language as colorful as you do," Puri said. He acknowledged that disagreement on the press statement, saying that one side -- the US -- proposed a statement that reflected only its view, but predicted that it could be "resurrected" in light of unfolding developments. Video here, from Minute 7:55. The now finalized UN report is clearly one such development. 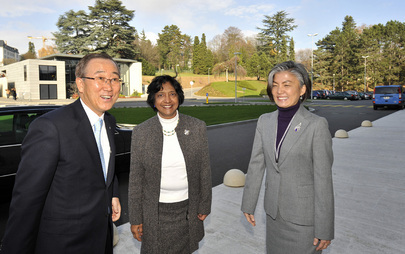 Inner City Press asked, since UN High Commissioner on Human Right Navi Pillay is coming to briefing the Council this week about Syria, if she will be asked to explain the report, which was edited to delete references in the initial draft to inaction by UN peacekeepers. There are other difference between the original and edited reports. But how does the UN justify airbrushing out the presence of its inactive peacekeepers? Inner City Press: in at least one instance, there was a description of an UNMIS independent contractor pulled out of a vehicle and presumably shot and killed. And in the initial draft, it says UN peacekeepers were present and did not intervene. And in the final draft, the presence of UN peacekeepers is entirely erased from the report. On this edit in particular, what was the process that took place in moving to this final report in which the peacekeepers are sort of airbrushed out? Acting Deputy Spokesperson Farhan Haq: First of all, there are actually very few differences in substance between the final version and the draft version, which was an internal draft which was still undergoing revision. The basic point is that the published report was shortened and was brought in line qualitatively with UN standards. What happened is that we did have to err on the side of caution to remove unsubstantiated elements from the report. At the same time, the basic thing is that the report was brought in line with the standards of the Office of the High Commissioner for Human Rights for public reporting, including the use of appropriate human rights language. And the Office of the High Commissioner for Human Rights went to great lengths to try to cross-check the substance of the report. For example, when allegations were based on one witness account, this was made clear. Inner City Press: This particular change, it’s only six words... is it not a substantial change to drop out the presence of the peacekeepers? Did they find that the peacekeepers weren’t present on 8 June? Acting Deputy Spokesperson Haq: Again, the basic point was to remove unsubstantiated elements. Also, of course, the report was carefully reviewed by legal and other experts. Acting Deputy Spokesperson Haq: I wouldn’t comment on any particular change of wording. My basic point to you is that this is the process that it went through. Otherwise, of course, we wouldn’t… in general, we don’t comment on the difference between an internal draft and the final draft. This is the final draft that has gone through the editing process and the process of legal vetting that all reports have to go through. Inner City Press: Does DPKO [Department of Peacekeeping Operations] have some kind of--was it allowed to edit this line out? That’s really where my question goes, since it is reporting on the UN’s own presence and inaction while a death occurred, it seems strange to have one of the editors be one of the parties presumably being reported on. Acting Deputy Spokesperson: Again, the entire point was for the Office of the High Commissioner for Human Rights to put the language in line with its standards. And that is what it has done through this particular process. But what are the standards -- deletion of criticism of inaction by UN peacekeepers? We'll say on this -- watch this site.